Hello everyone! I have yet another business to share with you today. 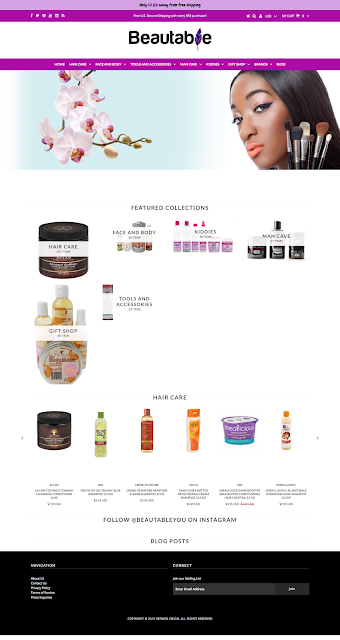 Beautible is an online beauty supply/book store founded by Jamila Foster who also acts as the brand's president. The goal of this company is to provide a "full shopping experience for people of color." The pricing is super reasonable and definitely some of the lowest out there in comparison to your local beauty supply or even other online BSS. Orders ship free starting at a $50 minimum. Otherwise ground shipping is $5 which is hands down one of the best deals around! They are also running a promotion for black history month (see below). If you are a reader and you know of a black owned business you'd like featured on Hypnotic Glamour, please leave a comment below. If you are a black owned business and would like to be featured on this site, please email:business@hypnotic-glamour.net with BOBS in the subject line. Also, if you have not already, please subscribe to Hypnotic Glamour by email by clicking here. This way, you will never miss a post!